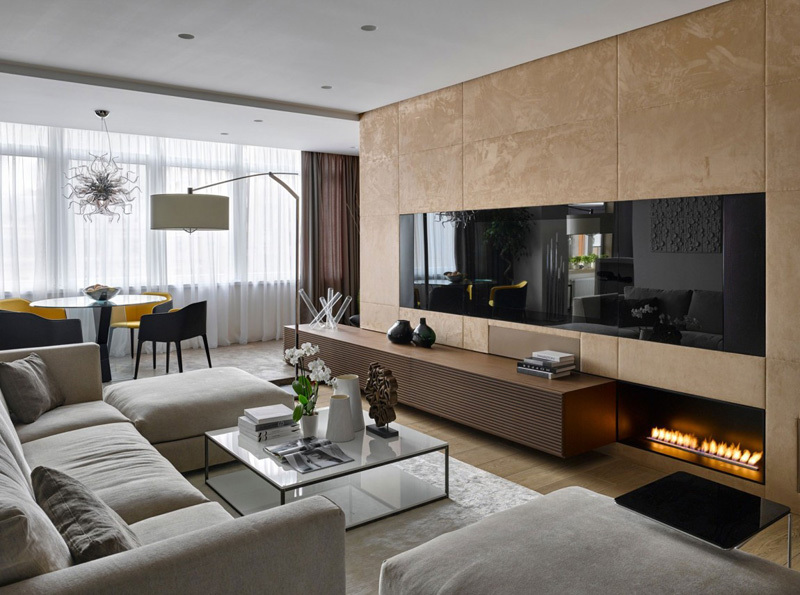 A beautiful and neat interior of an apartment in Moscow. Isn’t it enough for us to have an elegant and promising landscape, garden and swimming pool in the outdoor spaces to claim that we own a comfortable house? What are the other details in the interior do you want to consider for your own house? Today we will tour you in a residential house project which uncovers the promising details despite of its simplicity. 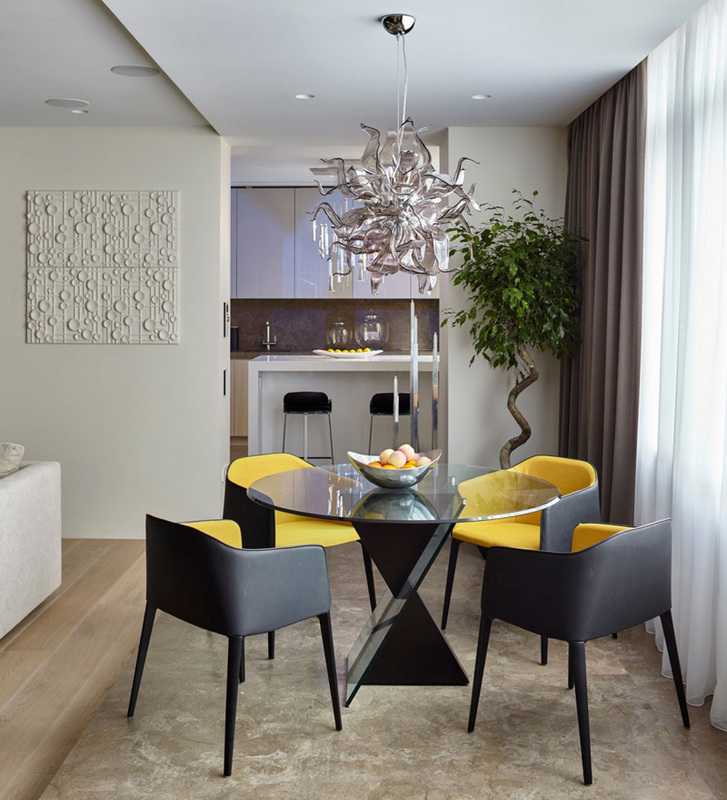 We may see how the designer underlines the fabulous and stylish interior designs that may certainly capture the heart of the homeowner’s guest. Let us see how the designer carefully considered the different glamorous furniture and accessories. We can observe it from the different amazing areas of the interior of the house. Expertise and essential architectural approach is tailored in every space of this house. The great quality and durability of the interior matters the most in completing this project. This house is named as the Country House which is specifically situated in Moscow, Russia. This residential house design is intended for a young couple with a child and they wanted to have an interior with modern, bright with warm and, cozy and extraordinary design. 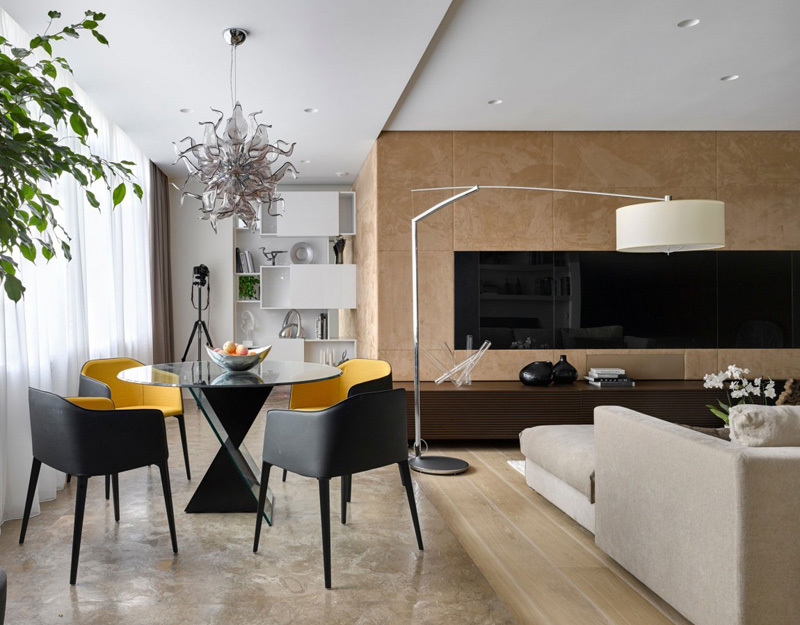 The designer responded to the wishes and simple requests of the client so they mix and match the different furniture and accessories to realize the artistic and unique design of the house. In fact the architects have tried to uncover the most space only that there was one restriction, the kitchen which separated bearing wall that prevented as they wanted to fully incorporate it with the living room. Let us see how these interiors remarkably underline the modern concept and its amazing details through the images below. Unique feature: This house projects a unique ambiance that you may experience in a matter of minutes to forget that you are in the city. 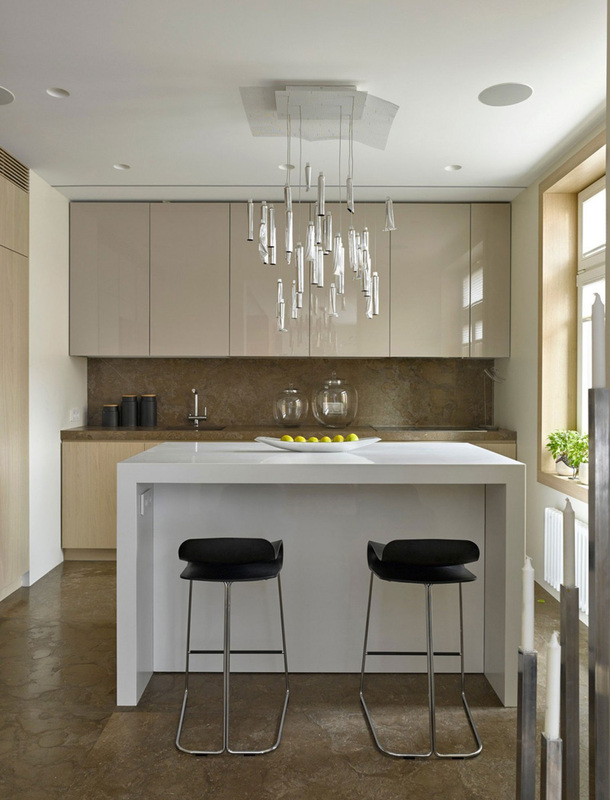 The remarkable lighting schemes in this apartment are well thought out as there are many different types of fixtures that allow the extraordinary interior design. Take a glance at the lovely and innovative design of the furniture and appliances in the living space. This made this space stand out among the other areas of the house. The colors of the walls and ceilings harmonized with the sofa and carpet in this living space. Neatness and elegance complement with each other in this area, too. 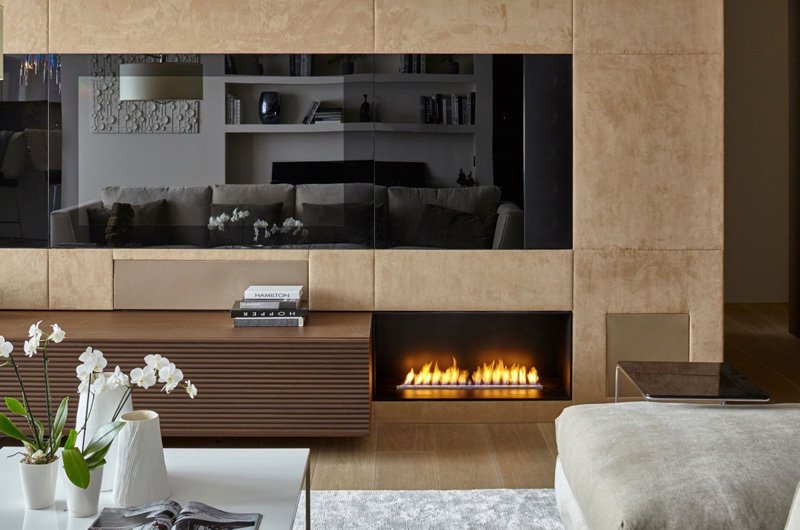 Fireplace designed and installed in this area emphasized comfort and charm. This also enhances the look of the living space with the durable cabinets. When you are looking for the best spot where you can sit down and study, this area is the best place to do so. You may also choose this space when you want to unwind from the stressful days in your office. 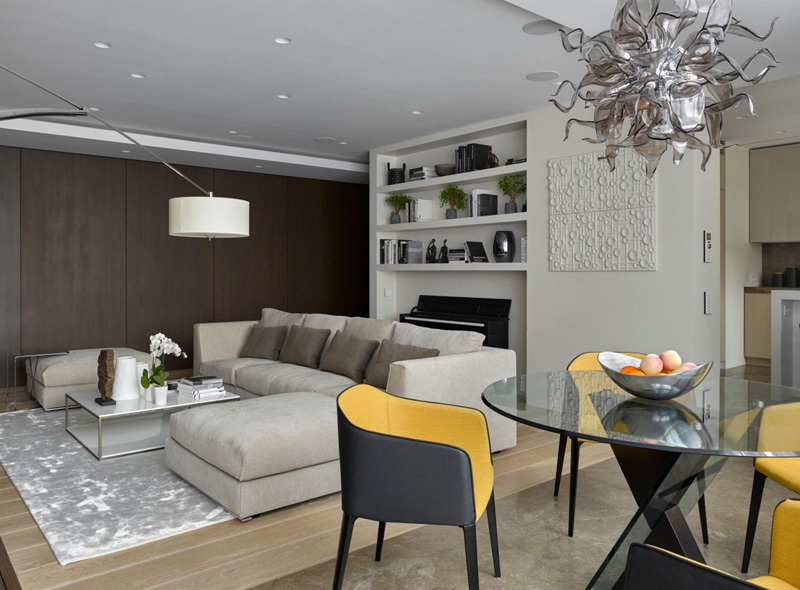 Observe how the designer place and designate each furniture in this living and dining space in one. These furniture does look expensive! Round table for four is elegantly set in this area for a romantic and enchanting aura. The yellow and black color of these seats blended well with the unique chandelier hanged above it. Edges and lines are also displayed in this small kitchen. The designer successfully maintained the fashionable and stylish theme in this area. From the kitchen, the client may also access the living space as well as the amazing features of the lighting scheme here. Let us carefully see the choice of shapes and forms that adds attraction in this area. Large bed is enough for this comfortable bedroom with amazing bathroom and trendy accessories. The dark and light color of the furniture and walls in this area also highlighted its remarkable texture. The sustainable light is also accessible in this bedroom. Eco-friendly features is also present in this space that we may see how the designer integrate the importance of plants to the interior. 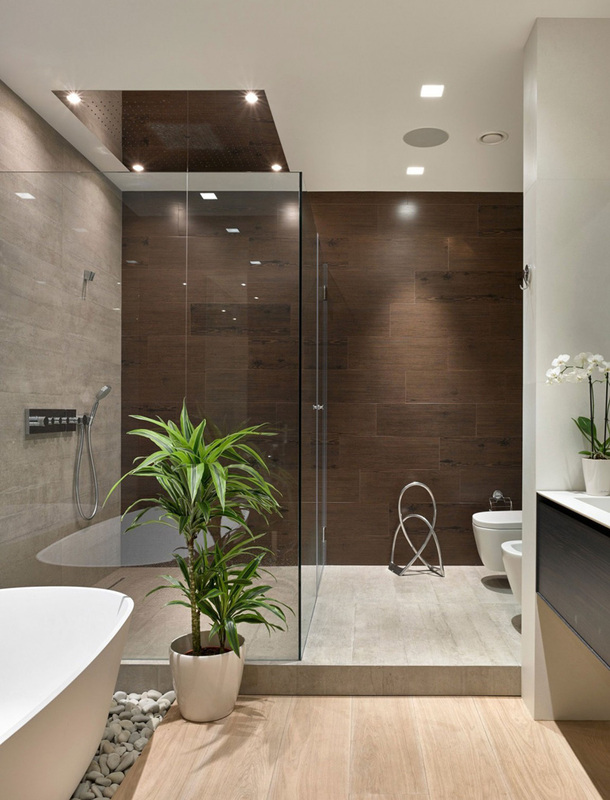 Transparency and romantic sense is achieved in this bathroom. 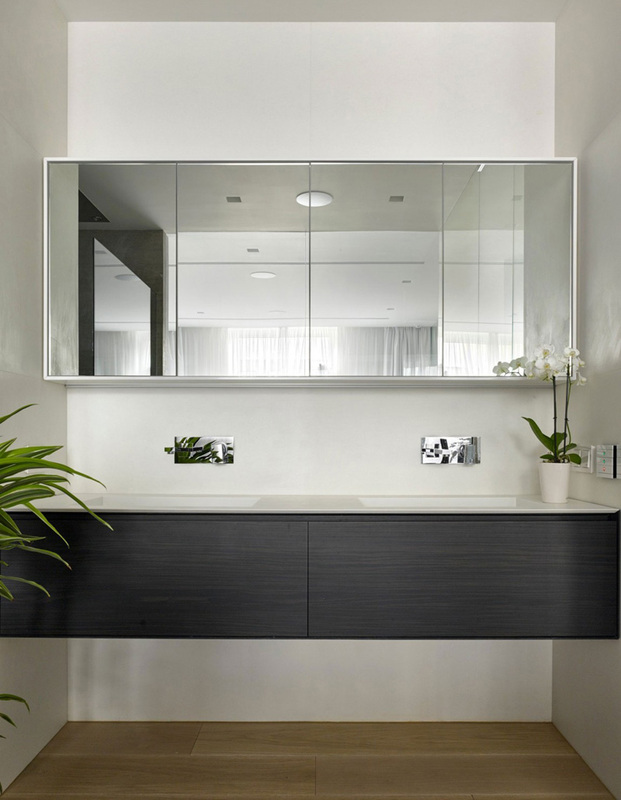 Trendy and stylish fixtures is also utilized to make this bathroom comfortable. 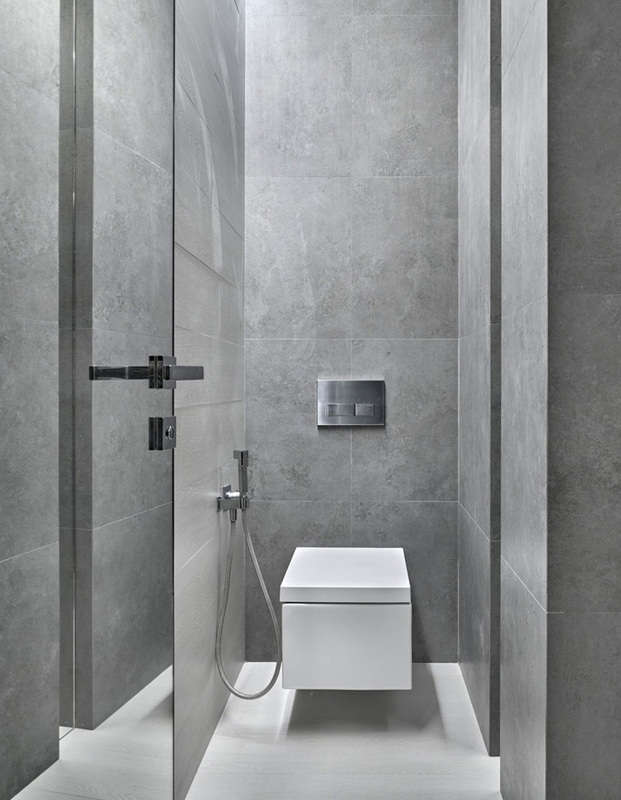 Glassed walls in the bathroom help the client to make this space accessible to them from the bedroom. Neat and highly expensive fixture is well-arranged here. See how these stones are assigned as the base in this bath tub as it improves the look of the bathroom. Modern and innovative design is employ in this area. Huge mirrors in this powder space can also provide comfort and great style, right? Plants help in maintaining the neatness and clean design of this area. Grey mosaic tiles applied in this toilet blended well with the toilet bowl here and other fixtures. 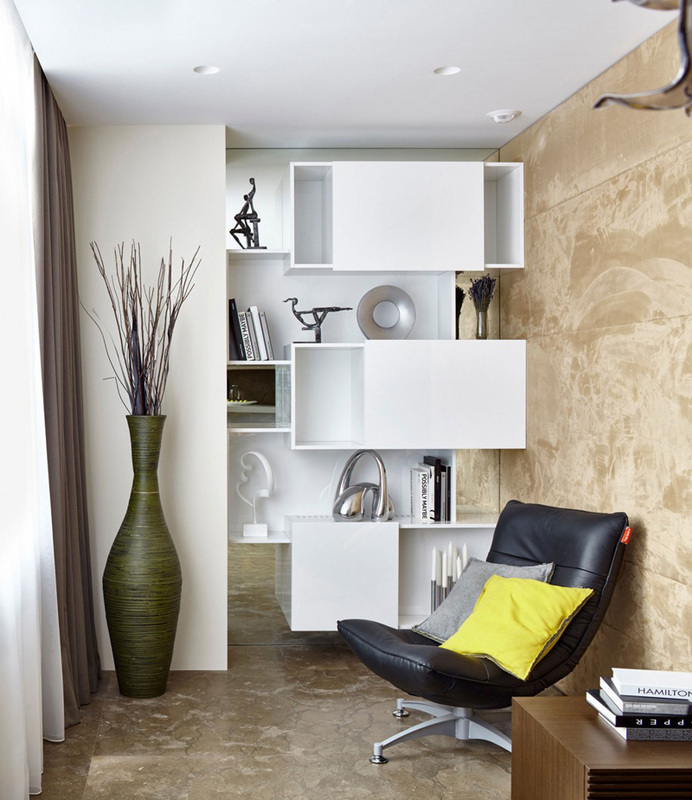 The walls displays the different textures that may create a different mood in this area. As you can see in the above images, we can say that this house project remarkably highlighted the hard work and meticulous design of the Aleksandra Fedorova Bureau. The partition made a wide opening, and the forced zoning in the area proved its advantages. There was once attached a large balcony where it was necessary to insulate the floor in it and so there were stretches along the windows podium on which the dining room and part of the kitchen. The living rooms are gone deep into the apartment while for each bedroom has its own dressing room, bathroom and study room. We hope that we have provided you another set of helpful ideas that you may utilize in our own house in the future.